The maximum number of applications per year is 2; and the minimum retreatment interval is 7 days. Do not exceed a total maximum use rate of malathion from all sources of 5 lbs ai per acre per year. Do not apply within 1 (one) day of harvest. Do not apply within 25 feet of aquatic habitats (such as, but not limited to, lakes, reservoirs, rivers, streams, marshes, natural ponds, estuaries, and commercial fish ponds).and a label mitigation to include a buffer zone of 25’ from an aquatic habitat. The rate of malathion @ 2-2.5 lb ai per acre MUST be used if you are to attain SWD control with malathion. The lower rates are not as effective. Other brands also have the Section 24C label which are good for this growing season. Malathion is the ONLY insecticide that can be used for the Canadian market that also has a 1 day PHI. Imidan (Phosmet): Several growers have asked about the use of Imidan (phosmet) and how its use relates to Canadian exports. Imidan is labeled in Canada for use on highbush blueberry. However the label as well as the MRL is different in Canada compared to the US. The US label allows 1.33 lb/A, applied a maximum of 5 times with a 3 day PHI. The Canadian label allows 1.43 lb/A (calculated equivalency of 1.6 kg/H), applied a maximum of 2 times with a 15 day PHI. US blueberry growers can use about 2.5 times as much Imidan for domestic markets as Canadian growers can use. The resulting Canadian MRL is 50% of what is allowed in the US. Therefore in order to safely export to Canada, growers must adhere to the US label for the individual application rate of 1.33 lb/A, but apply a maximum of 2 times with a 15 day PHI. DO NOT use this product for any Duke plantings intended for export at this time. Spotted Wing Drosophila (SWD): Spotted Wing Drosophila is still the key pest to control, so growers should choose materials primarily based on SWD control. SWD adult males are being captured in numerous locations, with numbers about the same as the previous week. DO NOT assume that ‘Duke’ can escape infestation this year, especially 2nd and 3rd pickings. Our traps are placed in ‘Bluecrop’ plantings simply to maintain the trap location for the entire season, but adult flies are attracted to the fruit as it starts to turn blue. Duke remains very susceptible now, and for the remainder of Duke season. Other later varieties like Bluecrop, Draper and Elliott will be more susceptible, since the SWD population will be higher as they ripen. Aphids: Aphid populations have increased since last week. Populations are still low on most farms, but if you have over 10% of terminals infested, then treatment is suggested. DO NOT use Assail as your only insecticide at this time, since it can be weak on higher SWD populations. If you elect to use a neonicotinoid like Assail for aphid control, you should follow with a material for SWD. Other choices for both aphids and SWD include the use of Lannate or Exirel. 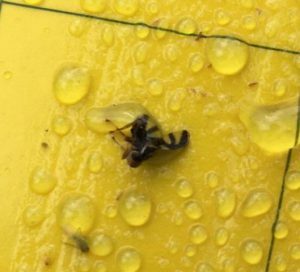 Blueberry Maggot (BBM): The first BBM adults were captured in the Hammonton area yesterday, 6/13. With the presence of SWD, no growers are on the trap-based Canadian export protocol. Therefore this first capture will initiate the regular controls that are required for Canadian exports. With the repeated use of insecticide for SWD, the BBM population should remain very low. All materials that control SWD also control BBM, with the possible exception of Delegate, which is still OK for low populations. Given the regular use of other products, there should be no BBM issues seen with rotated use of Delegate. If you are trapping for BBM adults, adult flies appear with a wing pattern illustrated in Figure 1. Figure 1. Blueberry maggot adult fly on trap (photo Nick Freeman). Oriental Beetle (OB): Oriental beetle adults started to emerge last week, with average trap captures in the single digits. Populations should rapidly increase over the next several weeks. Growers who are using Admire for OB treatment need to apply the product (or generic) @ 7-14 oz/A with a 7 day PHI. This material will control early stage larvae, so MUST BE APPLIED BEFORE mid July in order to be effective. The material must be pushed below the soil surface where grub larvae are located and out of direct sunlight. Therefore the application needs to be followed with .5 to 1” of irrigation or precipitation within 24 hr., or be chemigated in. Tufted Apple Budmoth (TABM): Adult trap captures slightly decreased in southern counties, but are close to the same levels as seen last week in northern counties. Some locations are experiencing over 100 moths per trap. The timing for insecticide applications overlaps with timing for OFM control (see below). In northern counties, a number of growers are using mating disruption for OFM control. Since this controls only OFM, if you have high trap counts (over 60-75 moths per trap), a single strategically timed diamide insecticide may be useful – see chart below. Native Stink Bugs and Brown Marmorated Stink Bug (BMSB): Increased stink bug activity is being seen in some northern locations. This is mostly from tarnished plant bug and native stink bugs. Remember that you can minimize catfacing activity by eliminating any flowering weeds that may be present in your orchard. San Jose Scale (SJS): Crawler emergence is well underway in both southern counties and northern counties. Since crawlers were not present last week in far northern counties, the following is repeated from the last newsletter: If you had known high populations of scale last year, it is important to note if crawlers are present, even if you treated with oil in the early spring. If crawlers are present then treatment options include Esteem, Movento, Centaur, and Diazinon. Esteem, Centaur and Movento should be applied at the beginning of crawler emergence. Diazinon is labeled for only one post bloom or foliar application on stone fruit (Rec = max. of 2 lb/acre of the 50W) and 2 applications for pome fruit, as a prebloom application was not made. Rusty Spot: Rusty Spot infections are visible statewide, especially in some northern counties. Growers in northern counties may benefit from one more fungicide application for rusty spot. As pit hardening is completed, no additional fungicides are of any benefit. Codling Moth (CM): No additional treatments are needed for the first generation, unless populations are extremely high as we continue to see in some northern locations with 11 to 50 moths per trap. The treatment level is 5 moths per trap. If you have treated with pyrethroids, Imidan or Lannate, then switch to another chemistry, such as Altacor, Belt or Voliam products, or Delegate; or plan on using Madex starting with the next flight. Second generation treatments should start around 1150 DD for IGRs and Altacor, and around 1250 DD for standard materials. This is projected to be about July 3-5 in southern counties and about 10 days later in northern counties. Tufted Apple Budmoth: See peach section above. Summer Diseases and Apple Scab: Primary scab infection symptoms are visible on fruit and leaves in several sites in both northern and southern counties, with additional lesions appearing this past week in northern counties. Orchards with primary scab infections need to keep a tight schedule. If your orchard is scab free then the primary diseases of concern are the Rots, Sooty Blotch and Fly Speck. If you are using the extended EBDC schedule, remember the label limits applications to 21# per season, or 77 days prior to harvest. Where anthracnose control has been difficult consider using a program that rotates any of the following Pristine, Merivon, Captan, or Ziram in your summer program. The following table is intended as an aid for orchard scouting. I t should not be used to time pesticide applications. Median dates for pest events and crop phenology are displayed. These dates are compiled from observations made since 1995 in Gloucester County. Events in northern New Jersey should occur 7-10 days later.